I was disappointed when I heard that Apple's I Pad was going to be around $500.00. I am waiting for portable reading devices to come down in price. I am amazed that no one at Apple foresaw the snickering that greeted the name "iPad" , comparing its name to that of a feminine hygiene products. It reminds me of auto executives who were clueless about why the Chevy Nova was not selling in South America until finally some rocket scientist in the advertising department figured out that "No va" translates as "It does not go." Clairol "Mist stick" sold poorly in German because "Mist" in German means "manure". Sierra Mist soda has not done badly in the US, although Yiddish speakers have the same scatological associations with the word "mist"
If Apple can bomb so badly on the name choice for an important product launch, they are probably getting other things wrong as well. Maybe people who are manufacturing e book readers will listen to consumers. I am looking for the perfect e reader. It has not yet come out. Here is what I'm looking for in my dream e-reader. 1) Durability. I want a reader that is designed to take abuse. Fisher Price makes toys that you really have to work hard to break. Any e reader should have a body designed by Fisher Price. It sounds like the Skiff (pictured above) might have this feature. I am eager to see what the Skiff offers by way of versatility.But how much will it cost? 2) Versatility. I want to be able to put any file I want onto my e reader, which I will call the Dream Reader. Txt, pdf, Mobipocket, I want my Dream reader to be able to crack any type of file I can think of. 3) Size. I want a device that is the size of an Etch and Sketch. My eyes aren't what they used to be. I want a page that is not torture to look at. 4) Simple accesories. I want a rechargeable battery that I can replace easily myself, without having to send my device in for repairs. If you want me to be hooked on your technology, don't deprive me of it for a moment longer than necessary. While we are at it, don't come up with some special cable that only you sell. If you can offer good cheap reading materials, i would rather spend my money on that. 5) Have a luxury and no frills version. Believe it or not, I don't crave a wireless connection everyplace. If I can hook up my device to a USB port so I can click and drag my files, I can get along fine by downloading onto my family computer and transferring files to my portable device. I suppose that wireless access is good, but I am not interested in surfing. I am interested in taking a big library with me wherever I go. Keep wireless access everywhere for the luxury version of my Dream Reader. 6) No games, please. I am not interested in a toy that some knucklehead will mug me for. I could even do without sound, but I might want to listen to audio books, so leave that feature on. I might also want to put podcasts on my device. My personal preference is Radio Canada podcasts. 7) Have high resolution picture capacity, but save colour for the luxury version. I'll do fine with black and white. 8) I want to be able to get articles from magazines without a subscription. Its expensive, but Highbeam.com offers access to a lot of magazines for a monthly subscription. I want a device that will work with Highbeam. 9) My library offers e books. I want a device that I can read library e books on. Additionally, Gutenberg.org offers a lot of public domain books. I want to be able to put their files on my device. My last portable reading device was a Palm Pilot. It was tiny and unwieldy. It was not compatible with my fat clumsy fingers. I hear good things about the Kindle in this area. But they seem too eager to lock me into their product line. 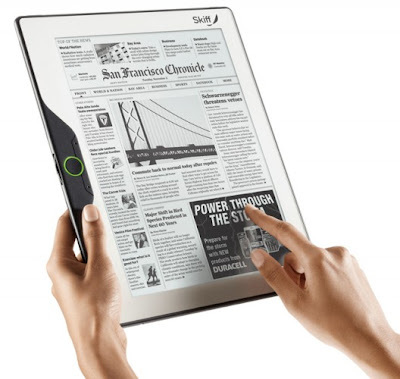 I want to see e readers that are as commonplace as cell phones are now. I have friends who will only talk on cell phones that are mini computers. I am a real basic sort of guy. I have a cell phone that is designed for fat fingers. I may even get a hands free talking device so my boss can yell at me on the road without my getting a ticket. My tastes in e readers is very similar. Hard to break. Easy to use. If I am stuck with your file system, I will resent you for it. If I see that your e reader is easy to break, I will replace it with something more durable when it does break. I have a Maytag stove that you can't open to clean. I found out the hard way when I opened it and broke it. You can rest assured my next stove will not be a Maytag. I will be buying an e reader before spring. It is a big plunge for me. I hope something will come out that fits my description. I'm the type of guy who does not like the latest technology, but only what is tried , true and redesigned after the glitches have been discovered. Is anyone listening? Such a nice post, its very interesting to read, tanks fir the sharing.